This photo shows some of our rough yellow feather jasper. The rough in the photo above is wet to show full color. and a single use grit kit. The yellow feather that we offer here is a very nice tumbling rough. The material that we sell is in pieces that range in size between 3/8" (9 mm) and 1 1/2" (38 mm). It shapes well when tumbled in a rotary tumbler and it polishes nicely in either a rotary tumbler or a vibratory tumbler using TXP or Rapid Polish (both aluminum oxide polishes). Other polishing compounds such as cerium, tin or titanium will also produce good results. Photos of tumble-polished stones are shown below. This yellow feather jasper has been crushed and sized to perform well in small rotary tumblers such as the Thumler's MP-1, A-R1, and A-R2. The size range gives the material a good tumbling action and eliminates the need for ceramic media. Our EASY Rock Tumbling Recipe works well for rough that has a Mohs hardness of 7 and has been crushed to a variety of particle sizes under about 1 1/2 inches. Fill your tumbler barrel about 2/3 full of rough. Then add 2 tablespoons of coarse (60/90) grit per pound of material in the barrel. Add water to just below the top of the rocks. Run the material in coarse grit for 1-2 weeks. One week in coarse grit will give you good results. However, we feel that two weeks in coarse grit gives you much better results. At the end of all steps in the rock tumbling process, make sure to clean your rocks and barrel to reduce the chance of coarser grit contaminating the finer grit steps.. Put your cleaned rough back into the barrel. Then add 2 tablespoons of medium (150/220) grit per pound of material in the barrel. Add water until it is just below the top of the rocks. Let it tumble for one week. After clean-up, put the rocks back into the barrel using 2 tablespoons of fine grit per pound of material. Again add water to just a little below the top of the rocks. Tumble for one week. The rocks should now be smooth and possibly starting to get a slight luster. IMPORTANT: Make sure that your barrel and rough have been cleaned thoroughly. Any grit carried over from a previous step will likely ruin your polish. Place the rough in the barrel with two tablespoons of TXP polish for each pound of material in the barrel. Add enough water to almost cover the rocks and let it tumble for one week. 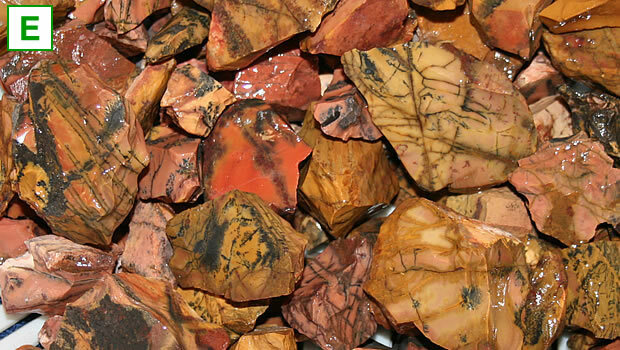 Jasper, agate and petrified wood usually take a great polish. However, burnishing this material after the polish step can often improve the shininess of the finished stones. If you would like to try burnishing to see if it improves the look of your polished stones full burnishing instructions can be found here. Ceramic media is not required, however, we always run at least 20% ceramic media in a vibratory tumbler because we believe that it improves the tumbling action and results in nicer tumbled stones. Check the bowl every 8-12 hours to ensure the action is still good. If the action has slowed, add water a little at a time until the action is back to normal. If the mud gets too thick you will need to do a complete rinse of the material and bowl. After rinsing, add fresh grit and water and start tumbling again. You are done with medium grit when you are satisfied with the shape and smoothness of the stones. Usually 4-6 days for us with this material. Give the material and bowl a thorough cleaning before moving on to fine grit. Place your material back in the tumbler bowl, then add enough polished ceramic media to bring the load up to the manufacturer's recommended operating level. Add one tablespoon of polish for every two pounds of material in the bowl. Then, turn the tumbler on and slowly add water until the material has a thin coat of wet grit and the tumbling action is smooth and fast in the bowl. Make sure that your barrel and rough have been cleaned thoroughly. Place the cleaned material back in the bowl. If needed, add ceramic media that has been previously polished, to bring the bowl up to the manufacturer's recommended operating level. Add one tablespoon of grit for every two pounds of material in the bowl. Turn on the tumbler and slowly add water. Stop adding water when the material has a thin coat of wet polish and the tumbling action is smooth and rapid. 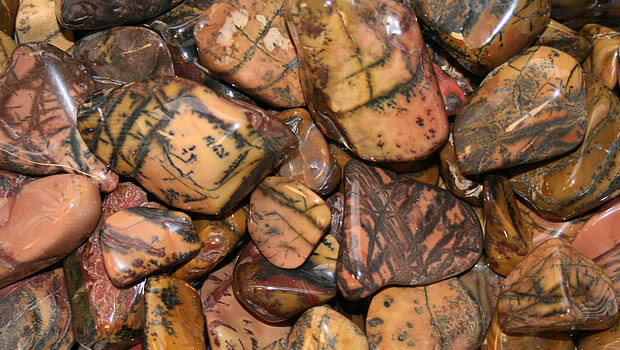 Jasper, agate and petrified wood usually take a great polish. However, burnishing this material after the polish step can often improve the shininess of the finished stones.